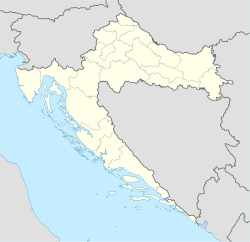 Šarengrad is a village in Croatia. The village is located in the Syrmia region, on the Fruška Gora slopes, next to the Danube river. According to the 2011 census, Šarengrad had 528 inhabitants. ^ "Vukovar-Srijem County - Town of Ilok". State Statistics Bureau of the Republic of Croatia. 2001. Retrieved 2010-09-13. Wikimedia Commons has media related to Šarengrad. This Vukovar-Srijem County geography article is a stub. You can help Wikipedia by expanding it.